I love to grill in the summer and if I could I would either use my grill or my slow cooker all year! 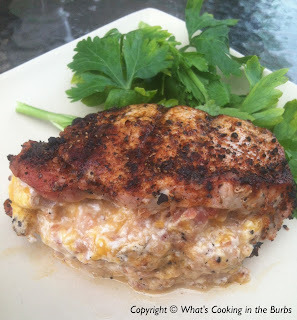 I've always loved stuffed pork chops and I wanted to create my own version using bacon and cheese and then grilling them instead of the traditional chops that were stuffed with a herb stuffing mixture. Oh my goodness, these were SO good! Prepare the stuffing by mixing the grated cheese, bacon, parsley, and cream cheese together in a small bowl. Set aside. Place the pork chops on a cutting board. Cut a pocket into the pork, starting from the fatty side and going nearly all the way through but leaving the sides intact and the opening small. Stuff about one-fourth of the mixture into each pork chop. Season the outside with southwest seasoning. Push the mixture far into the pocket of each pork chop with the cheese mixture pushed away from the opening. Push two toothpicks diagonally through the outer edges of the pork chop to secure the opening. Grill chops over medium heat for about 8-10 minutes per side. Let sit one minute before serving. Enjoy! I'm drooling....literally! Looks amazing! Pinning. We have had these twice now. They are amazingly delicious. I would straight up eat a bowl of the stuffing. Going to try it on a steak this weekend. Brian - Alaska!